Shares of Microsoft fell 2.44% after news the company received 238 internal complaints about gender discrimination and sexual harassment. This was part of a lawsuit filed by female employees at Microsoft. 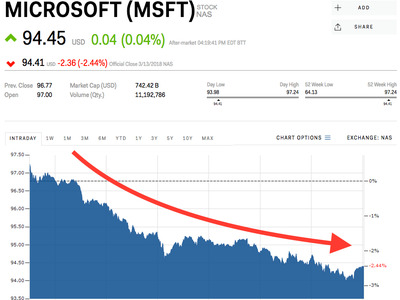 Watch Microsoft’s stock move in real time here. Microsoft was the latest company to reel from sexual harassment and gender discrimination allegations. Shares of tech giant slid 2.44% on Tuesday following news the company received 238 internal complaints about gender discrimination or sexual harassment between 2010 and 2016, according to a Reuters’ review of court filings made public after Monday’s closing bell. The world’s largest software company has been wrapped up in a lawsuit alleging it was systematically denying pay raises or promotions to women in US-based technical jobs, according to the court filings. The lawsuit has received wider attention because it is the latest in a series of claims of a discriminatory culture in the technology, entertainment, and media industries. Microsoft’s stock closed at $US94.41 per share on Tuesday. It was one of the worst performers in the Dow Jones industrial average. Shares are still up 9.46% for the year.